Vacuum Carburizing. By achiving ISO 9001 and AS9100 registration Midwest Thermal-Vac has taken considerable measures to not only maintain it’s Industry leading status, but exceed it. While this may be good enough for some heat treating facilities, Midwest Thermal-Vac has successfully achieved Nadcap accreditation to show that our pyrometry procedures are controlled, consistent and repeatable enough to meet the highest standards and tolerances within the aerospace community. 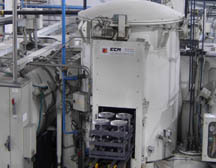 MTV uses the patented Infracarb process from ECM, which allows low pressure Vacuum Carburizing, Carbonitriding and other case hardening applications to be done under vacuum. By taking advantage of the latest technology and processes, the potential for large savings is available through less distortion. This means less stock needs to be taken off during final grinding and consistent tolerances mean more usable pieces per lot and savings for our clients. MTV can also satisfy your needs for conventional solution, isothermal, spherodized or full annealing, homogenizing, normalizing, austenitizing and tempering tool steel. All stainless steel processes are also conducted under vacuum. Staffed by the companies’ two metallurgists and several engineering professionals, MTV’s facility features a complete metallurgical laboratory. Low-pressure carburizing Since being developed in the late 1960's, much progress and many improvements have been made. Modern technologies and recent advancements in low-pressure carburizing (LPC) within the last fifteen years have made many companies throughout the industry realize the many proven benefits of LPC, primarily it's capability of precise process control, can no longer be ignored. Tight control enables absolute repeatability, optimized part microstructure, enhanced mechanical properties, and reduced manufacturing costs. While some heat treat companies have just begun realizing the benefits and have begun offering LPC services, Midwest Thermal-Vac has been vacuum carburizing since 1999 and continues to be an industry leader. Demand for vacuum carburizing systems equipped with high-pressure gas quenching, oil quenching, or both has quadrupled since 2000, as the technology has replaced atmosphere carburizing and traditional oil quenching in many cases. New advances in vacuum furnace technology help integrate heat treating equipment on the shop floor and into the production flow of the manufacturing process. Temperature uniformity is critical for vacuum carburizing, especially in the low-temperature ranges, and a maximum spread of ?0°F (?.5°C) is required to maintain tight case depth control throughout the load. This is equally important for vacuum carbonitriding cycles, which are run as low as 1425°F (775°C). Highly loaded gears and shafts, such as those in off-road vehicles under extreme race conditions, require fracture toughness values two or three times those of conventional vehicles. Tightly controlled low-pressure vacuum carburizing processes deliver these high-performance values. Hardness: The new materials require better control of hardness and carbon distribution (case/core hardness, surface/near surface), optimized microstructures, and control of such factors as retained austenite, carbide size (type and distribution), and non-martensitic phases. Property control is also critical, especially for characteristics such as residual stress patterns and surface finish, and mechanical properties such as toughness, impact strength, and wear resistance. Improved performance demands in aircraft and rotorcraft not only are pushing the development of advanced materials, but also are driving prime contractors and their suppliers to low pressure vacuum carburizing. 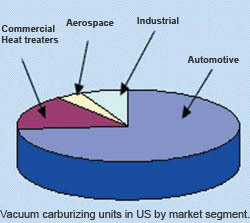 Typical commercial and military aircraft applications of low-pressure vacuum carburizing include braking systems, actuator systems, flight controls and guidance systems, hydraulic power plants, landing gearboxes, and components such as bearings, ball screws and nuts, planetary gears, pinions, and shafts. To improve part performance throughout the industry, commercial heat treaters are beginning to share their knowledge with respect to successes and lessons learned.